Tute Chigamba was born into a family of traditional and spiritual musicians. The son of a master drummer and dancer, Sekuru Chigamba has kept the traditions of his musical heritage alive so that now many of his own children and grandchildren lead others in carrying on these traditions. His daughter Irene has danced with the National Dance Company of Zimbabwe and founded the Mhembero Dance Troupe of Zimbabwe. He is a virtuoso mbira player who favors the "Gandanga" tuning. He has composed many mbira songs which are available on his recordings and are now played by students of his throughout the West. A key player at ceremonies during the struggle for independence from 1972-1979, Chigamba's popularity has since spread not just across Zimbabwe, but throughout the world. He has introduced thousands of people to mbira and now receives students from many countries at his home in Zimbabwe where he continues to compose songs and hold healing ceremonies. 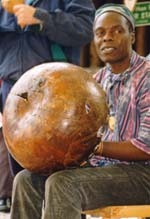 Sekuru Chigamba is reknowned as an mbira maker.